Cloud Datastore is a highly-scalable NoSQL database which Google promotes for scenarios that require high-availabilty and durability, and is capable of multiple features such as ACID transactions, SQL-like queries, indexes and many more. This in combination with the characteristic for the NoSQL database solutions of being able to handle different data types, great scalability and the great performance makes it a choice you should have in mind when considering the architecture of your application. You can find more detailed information regarding the Cloud Datastore product on its official documentation page. The purpose of this article is to familiarize you with the .NET API designed for the product and show you how you can manipulate the database - add, retrieve and update items from it. For the purpose of this example, you have to enable the Google Cloud DataStore API. Please read the Getting Started article for more information on how you can achieve that. You also have to set up a DataStore instance which can be done by following the Datastore Quickstart tutorial. Create a standard Universal Windows Platform application and add a RadDataGrid. It will provide an interface to update the entities in your DataStore instance. Open the NuGet Package Manager and install the Google.Cloud.Datastore.V1 package. 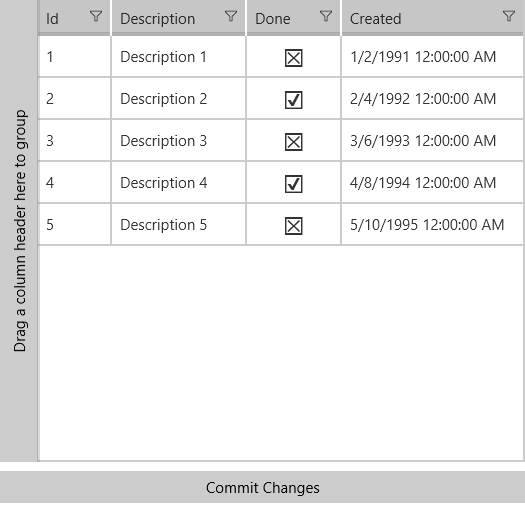 Example 2 shows the Task class which will hold the example data. The Id property will be used for retrieving the item from the DataStore instance. The next step is to create the ViewModel. It will need a DatastoreDb object which will be responsible for adding, retrieving and updating entities from the DataStore instance and a KeyFactory object which will create keys. In the AddTasksToDataStore method we are adding a couple of Task entities which have the same properties as our Task class. Then in the GetTasksFromDataStore method we are retrieving the entities from the DataStore instance, converting them to Task objects and adding them to an ObservableCollection which will be the ItemsSource of our RadDataGrid. In the OnEditEnded method which is called when the commit button is clicked, we are using the Id property of the Task objects in order to retrieve the correct entity from the DataStore instance, modify it and update it. In order to connect to the DataStore database, you need to have a GOOGLE_APPLICATION_CREDENTIALS environment variable set pointing to the JSON file downloaded when creating a service account. For more information on Datastore API, check out the Getting started with the Google Cloud Datastore API article. All that is left is to set the DataContext to the ViewModel and pass your project id as a parameter. Please note that we are preventing the generation of a field for the Id property of the Task objects since we only need it for retrieving the correct entity from the DataStore. In order to locate your project id, please read the Locate the project ID help article.